... adds to good looks, but allows for easy dismantling should servicing become necessary. 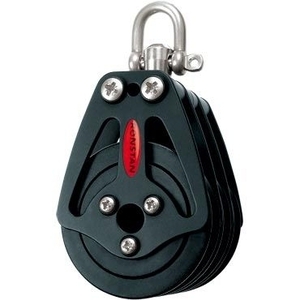 Available in three sizes, these blocks are compatible with the toggle connections on our ball bearing mainsheet travellers. Master® Stainless Steel 22mm Ball Bearing blocks are compact and light. They are designed for sailboards, dinghies, and control lines. Our Carbon Blocks are produced with emphasis on design and strength. The blocks have aluminium ball bearing sheaves and are bolted together with allen screws for easy disassembling if needed. A swivel block has a swivel at the top which permits the block to rotate through 360°. These fittings are commonly used in multi-sheave sheet block and tackle assemblies. This is particularly useful since the crewmember hauling in or easing the sheet is not always in the same place. The swiveling shaft is an integral part of the block. It has a hole for an attachment fitting, usually a shackle.